Tomorrow (Sunday), Trust in Yellow hosts a ten-year reunion for the Conference North title-winning team of 2005. There has been a tremendous level of interest from Southport fans and the players from that season and it promises to be a fantastic day. One of the great features of that title-winning season was the unique bond between players and fans so it would be great to see plenty of supporters on the day. The evening event in the Grandstand Bar has sold out but the reunion starts with a match at the Merseyrail Community Stadium between the squad from 2005 and a team of fans. The match is open to everyone to attend and admission is just £2. Kick-off is 2pm. The players are really looking forward to meeting supporters again so please come along to the Merseyrail Community Stadium and welcome home the heroes of 2005. Crowd favourite Kevin Lynch regards the day Southport won the Conference North title at Harrogate Town as a moment he will always treasure. The Southport squad of 2005 return to the Merseyrail Community Stadium on Sunday to celebrate ten years since that epic championship victory in an event organised by Trust in Yellow. Lynch, a summer signing ahead of the title-winning campaign, joined Southport towards the end of his career, but went on to play an influential part in the Sandgrounders’ success. “Winning the league was an unbelievable feeling and to win the Conference North in its first year means we will always be remembered,” said Lynch, speaking to the Trust ahead of Sunday’s reunion. “It was such a proud moment in my football career. I joined Southport because I wanted to win things and I felt Southport were club that matched my ambition. Because of how I am, I felt that once I was playing I could play a massive part in the club’s success. “There are many treasured moments I have from the 2005 season. My time at Southport began with scoring in a friendly against Everton and I got some other important goals. “The fans singing my name was very special, but the game at Harrogate is the one that stands out because of the magnitude of the game. We went there knowing that, if we won, we would win the league. With the championship in the balance until the final day of the season, Southport were pushed all the way in the title race by Droylsden. As well as an unbreakable team spirit, one of the defining features of that Southport squad was the special relationship with supporters, and few players typified the link with the fans more than Lynch. “I would like to thank the fans for how good they were with me,” he added. “This is one of the great memories I have of the club. The fans are the heartbeat of any club and Southport fans are up there with the best so I would like to thank them for the support they gave me. “On the pitch, the key players for us were Steve Dickinson in goal, and Mr Versatile and Mr Consistent, Sid Pickford. Farrell Kilbane was as mad as cheese but a rock at centre-half. Terry Fearns scored so many of our goals and he should have made it as a professional. “There was also Carl Baker's trickery but there were other great players as well, like Steve Daly, Chris Price, Earl Davis and Neil Fitzhenry. One of the things that does stand out is the great team spirit we had. Since hanging up his boots, Lynch has forged a successful coaching career. Having started out as manager of Marine, he joined former Southport manager Paul Cook on the coaching staff at Chesterfield, where he won promotion to League One. “I left Southport to join Droyslden who I helped win the Conference North again, then I went on the play for Marine,” Lynch said. “I became Marine manager in 2009 and I was in charge there for four years before I was head-hunted by Chesterfield to join their backroom staff as first-team coach. There, I helped them to win League Two, reach the final of the Football League Trophy at Wembley and then secure a play-off semi- final in League One. “Due to the success, Portsmouth approached Chesterfield to take the management staff but I couldn't commit to leaving my family to move down there, so I am now at Blackburn Rovers’ academy. The reunion for the 2005 title-winning team takes place on Sunday - and Trust in Yellow wants you to be there. Although the event in the Grandstand Bar has sold out, the day starts with a match at the Merseyrail Community Stadium between the squad of 2005 and a team of supporters, kick-off 2pm. Entry into the match is just £2 and the Trust is urging supporters to get down to welcome home the heroes of ten years ago. There are also features with other players - Farrell Kilbane, Earl Davis, Terry Fearns, Jimmy Williams, Neil Robinson, plus manager Liam Watson - in a special 32-page souvenir programme produced for the reunion which looks back at the title-winning campaign. The programme is on sale on Sunday for £3. 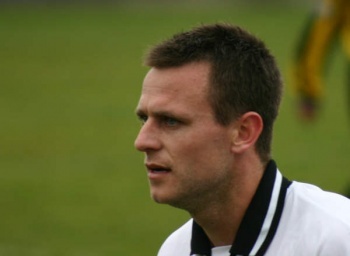 Ahead of Sunday’s reunion for the Conference North title-winning team of 2005, the Southport Champion featured part of our interview with manager Liam Watson. Our souvenir programme for the reunion includes a feature-length piece with Watson across four pages, covering all topics from the night he brought his Runcorn FC Halton side to Southport, to the day the Sandgrounders won the league at Harrogate Town. The piece from the Champion can be read HERE. Thanks to Ron Ellis and the Champion for their promotion of the reunion and their continued support of the Trust. The limited edition reunion programme features an in-depth look back at the 2005 season ad is available on the day for £3. There are four days to go until Southport’s legends from 2005 return as Trust in Yellow hosts a reunion for the Conference North title-winning team. That season is still remembered by supporters as one of the best ever seen, but how do the players look back on it? Here, Chris Price, the captain of the championship squad, gives his take on that unforgettable season with a question and answer piece. 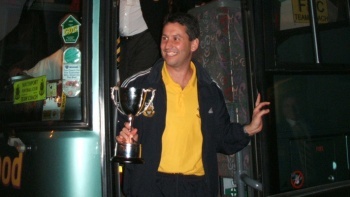 Chris, who was one of the first signings made by manager Liam Watson following his appointment in October 2003, saw first-hand the rebuilding job which resulted in Southport becoming champions. You were a player when we won the league in 2005 and part of the coaching staff when we did it again in 2010, how did the two seasons compare? When you are a player and you win the league you are so elated to have played a massive part in the success. As captain, you feel immensely proud of yourself and the whole team. You have experienced the total involvement of being on the front line. All of your hard work in training has paid off! When you’re on the management side of things, the journey to success is completely different. You just hope that your coaching and support has inspired the players and you want to win the league for them and the management. You want the players to do their best and try to shield them from any criticism. Ultimately, when things go right or wrong, the management team are held responsible so you want to win for different reasons than when you are a player. I feel privileged to have experienced both sides of the game. You were one of the first signings made by Liam Watson when he became manager. What was it like being part of the team that was built to win the league? It was interesting as many players had to be moved on and others were brought in, so it was a combination of being excited and anxious when I first joined Southport. It was such a big club and had a massive fan base for Non- League level. It was a challenge that I relished. I didn’t know many of the players who were there and I knew I had to prove myself to them. Liam had a strong strategic plan and wanted me to become his captain and get players on side to have the belief that our team could be successful. It worked! What moments stand out for you from the 2005 season when we won the league? Beating Droylsden away 3-1, when Steve Daly scored late on, was a highlight. So too was winning 5-0 at leaders Kettering Town when Sid Pickford scored a rather special volley I seem to remember! Southport were neck-and-neck with Droylsden for most of the season. What do you remember about the end-of-season run-in and winning the league on the final day at Harrogate? Who do you remember as being the other key players and characters in that team? Terry Fearns was a sensational goal scorer and Farrell Kilbane was solid at the back. In midfield, Sid Pickford and Dominic Morley were both Mr Consistent. The whole team was full of character and spirit. You’ve played for Liam a couple of times and worked with him a lot. What was he like as a manager and how did he get the best out of the team? Liam was a fantastic manager and is still a true friend. He could relate to the players firstly as a coach and second as a father figure. He had a firm but fair approach. He was well respected and got the best out of everyone. He knew the strengths of the players and had high expectations of the team, as well as being nicknamed Statto!, Donny Osmond and Ed Miliband hee! Chris will return to the Merseyrail Community Stadium, along with his former team-mates, for the Class of ’05 reunion on Sunday - and Trust in Yellow wants you to be there. The reunion, hosted by the Trust, starts on Sunday with a match between the squad from 2005 and a team of supporters, kick-off 2pm. Entry to the game is £2 at the turnstile and supporters are asked to turn out in their numbers to welcome back the heroes of ten years ago. The reunion continues after the match in the Grandstand Bar, although this second part of the event has sold out. As part of the build-up to Sunday’s reunion, we’ll have a piece from another member of the 2005 championship-winning squad and crowd favourtie, Kevin Lynch, at the end of the week.